Thoroughbred racing coverage takes another hit. As sport giant ESPN has decided to cut its coverage of the Kentucky Oaks (gr.I) on Friday May 1, with its primary three networks, and opted for Bravo. I am an optimist, and Churchill placed a positive spin on ESPN's decision. It is true that Bravo will bring in new eyes and primarily appeal to the female audience. Carson Kressley is also a large personality often seen on this channel, and he has been very eager to share his love for Kentucky, horses, and the Derby. Those are all pluses. Alas, I am disappointed by the actual sport networks, I think the economy had a factor, since ESPN would trump Oaks coverage to "gain more eyes" with their standard gammit of programming than with horse racing. Heaven forbid they cut to one race of amazing talent in sports. An issue that flashes back to the Breeders' Cup coverage in many ways, I hope they think about equal representation of boys and girls. The Oaks is more exciting than the Breeders' Cup Ladies Classic (formerly Distaff) from last year for me...and that says a lot. 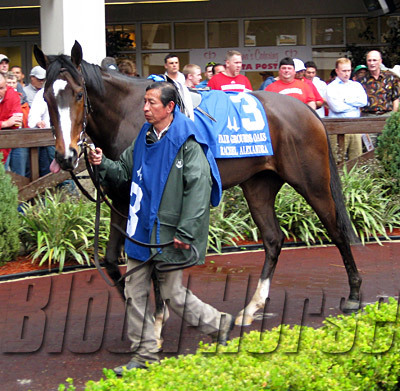 I want to see Rachel Alexandra beat Stardom Bound. I want Medaglia d'Oro to be recognized for his first 3-year-old crop because I have been very impressed with them since their debut. 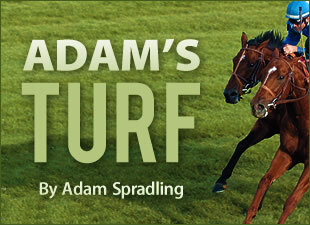 Our Maiden Watch blog did a phenomenal job following Medaglia's offspring. 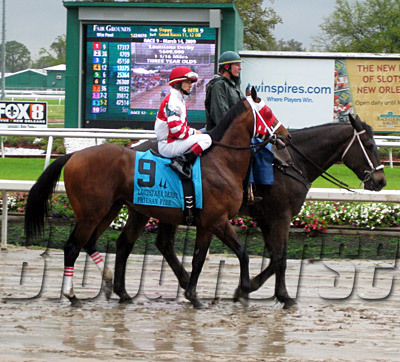 The field in the Oaks will be as fun as the field in the Derby. I whined enough about the BC coverage and changes, so I will not rant much on this change. Why? I'm not surprised. It is tough admitting that, but I have loss respect, again, for ESPN's complete coverage in sports, or lack there of. If you haven't heard yet, Blood-Horse web videos that we love so much, are now going to be broadcasting on Canadian Television. So if you live in Canada, be prepared to see the mugs of Lenny, Steve, Jason, Evan, and Tom. And They're Off as well as That Handicapping Show are set to air. So how are my Derby/Oaks picks still shaping up after this past weekend? Capt. Candyman Can - I am willing to give him another chance, he still has it in him, let's seem him prove it. Chocolate Candy - I have enjoyed how he has handled himself every-time he has run. Terrain - One of my very first picks from last year, I liked his recent run in the LA Derby, and think he will peak at the right time. Imperial Council - Will be my show bet...plan ahead for your exotics and finish positions. Beethoven - I have a feeling, and I am an avid music junkie. Hello Broadway - Not sure what I think, but I think something good.. The Pamplemousse - Has grown on me, like a grapefruit on a tree. 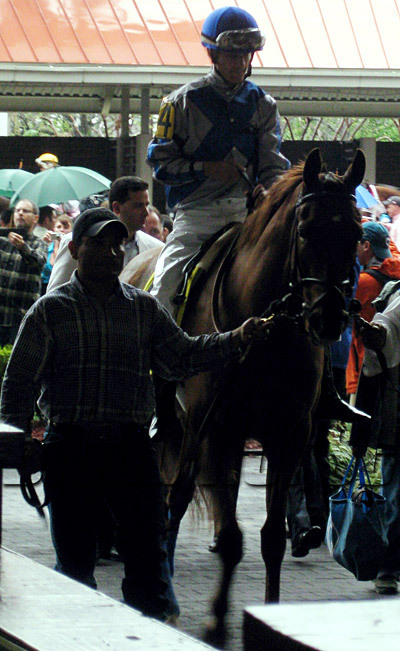 Pioneerof the Nile - Not one of my original picks, but a horse I have to recognize for skill. Old Fashioned - Can he get it done? Possibly. Friesan Fire - Not an early pick either, and he probably won't be a personal favorite of mine, but I have to admit now he is legit. Giant Oak - I still love Giant Oak. His closing move in his most recent race was huge, but not enough. After following Pyro and watching his talent, I don't think the Derby is structured for closers. One or two freak wins have happened from closers, but I just don't see it this year. He needs more time to develop, and he will be really good later on. It is apparent theories were right, he is not going to the Derby. I first heard rumors yesterday morning, but it has since been confirmed. Notonthesamepage - I don't think he will get it done, so I have lost confidence. Atomic Rain - Just need to see a bit more from him. How are your Derby/Oaks picks shaping up? Kodiak Kowboy gave some action recently, finishing second in Louisiana. He is one of the horses I follow, and I have not heard much on him recently. Here's a shout out to him.